An essential thing you need to remember while bottling – whether jam, jelly, squash, juice, pickle or anything – leave gap for at least ½” from the lid portion and never fill full. This is to allow some room for gases, expansion etc. If fruit pulp is readily available you can skip the procedure to make the pulp. Whenever you select fruits for jams or jellies, select ripe and fresh fruits but not too ripened ones. The fruits should be firm. Similarly select some just ripening fruits since these contain more pectin than the ripen varieties. Guava is available in two varieties – pink or white inside. The colour for the jam is also chosen accordingly. If the guava or even other fruits are over ripe or saggy, be careful since these may contain worms of the same colour as that of pulp. Wash the fruits well to remove mud, external impurities and dirt. Wipe with a clean cloth. Cool dry. Cut the fruits with knife into halves to scoop the seedy portion. Ensure that no seed is left in the pulpy portion. Cook these halves in hot water till they become soft and can be mashed by hand or hard churner. Alternately you can grind these in a pulveriser to make the pulp Measure these and add equivalent quantity of sugar. Mix well and heat. Constantly keep stirring. When it starts boiling add citric acid crystals and continue stirring. When it leaves the side by not sticking to the side and clear more or less, put off the fire and remove. Add the colour, essence and the preservative. Stir well and pour the hot jam in sterilized airtight jars and when cool seal the lids tightly. Store in a cool place or refrigerate. You can prepare this from pure tomato puree if available without any ingredients. This will however, be costlier. 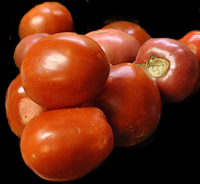 Buy fresh, ripe and firm tomatoes. There are two varieties – one with more pulp but less sour and the other more sour but with less pulp. Buy the one that has more pulp. Wash the fruits well to remove mud, external impurities and dirt. Wipe with a clean cloth. Cool dry. Blanch in hot piping water for 10 minutes all the fruits closing the lid. Remove the lid thereafter and allow to cool. The skin would have shrunk by now. Peel them easily and place on a big bowl. Mash each fruit one by one in a good sieve so that the juice separates and strained. The pulpy portion can be separated from seeds as far as possible but never allow any seed. Measure these and add equivalent quantity of sugar. Mix well and heat. Constantly keep stirring. When it starts boiling add citric acid crystals and continue stirring. When it leaves the side by not sticking to the side and clear more or less, put off the fire and remove. Add the colour, essence or cardamom powder and the preservative. 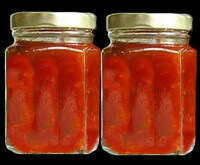 Stir well and pour the hot jam in sterilized airtight jars and when cool seal the lids tightly. Store in a cool place or refrigerate. This entry was posted on March 9, 2012 at 10:00 am and is filed under Jams, Morabbas, Squashes and Sauces with tags citric acid crystals, essence, food colours, guava jam, guava pulp, Jam, Jelly, Morabba, pectin, potassium metabisulphite, sauce, sodium benzoate, squash, sugar, tomato jam, tomato pulp. You can follow any responses to this entry through the RSS 2.0 feed. Both comments and pings are currently closed.